A dashing and skilful wingman/centreman, Ray Stokes was one of two brothers who crossed to Richmond from the north-west coast in the aftermath of World War II. Born in Longford in 1924, Stokes moved to the north-west coast while still young. He soon made a name for himself as an outstanding schoolboy footballer, representing the state at the 1938 National Schoolboys Carnival in Melbourne. Aged 15 when World War II broke out, Stokes had to wait until the age of 20 to make his first appearance in senior football, playing with Burnie in 1944-45 during one of the club’s many absences from the NWFU (at this time playing instead in the Burnie Football League). Despite playing in this lower grade of football, Stokes’ talents were apparent enough for him to be lured across to Victoria to play VFL football with Richmond. He had initially agreed to join the Tigers as early as 1944 after a visit by Tigers captain Jack Dyer and secretary Maurie Fleming, however his employment in a “protected industry” in the war effort prevented Stokes from moving to Victoria until early 1946. Stokes made his VFL debut in Round 5, 1946 and played 13 games in his first season. Over the next six years Stokes played 93 senior games for the Tigers, including their 1st Semi Final loss to Fitzroy in 1947. 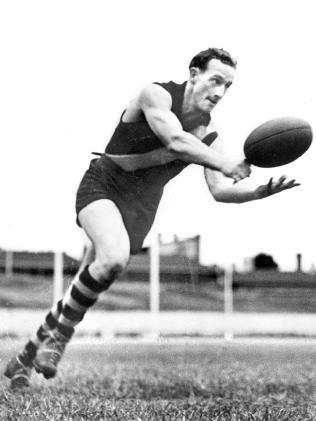 A consistent and occasionally brilliant performer during his time at Punt Road, he was highly regarded both inside and outside the walls of the club – Tigers legend Jack Dyer once described Stokes as “the best thing to ever cross Bass Strait” – while his performances were often noticed by the men in white; Stokes polling 31 votes in Brownlow Medal counts in his six seasons. In 1948 Ray was joined at Richmond by his younger brother Jervis, who had also played with Burnie, and in fact it was an injury to Ray that allowed Jervis to make his debut with the Tigers. After playing all 18 games for the Tigers in 1951 – a year in which he had been spoken of as an outside Brownlow Medal chance – Ray Stokes opted to go back home to Tasmania. Upon his return, Stokes re-joined his original club Burnie, who by now had returned to the NWFU. Appointed as captain-coach of the Tigers, Stokes led the Tigers for the next six years, during which period he was the recipient of a number of individual and representative honours. He appeared twice for Tasmania at National Carnivals in 1953 and 1956 – the latter as vice-captain – while he would captain-coach the NWFU representative side numerous times between 1952 and 1957. At club level, Stokes guided his Burnie side to a premiership in 1954, a great achievement in a decade largely dominated by Ulverstone. 1954 would also see Stokes achieve the highest individual honour of his career, taking out the Wander Medal as the Best and Fairest player in the Union. Stokes retired from football after the 1957 season. In later life he kept strong links with Richmond and was close mates with coaching great Tom Hafey. He also stayed involved with the NWFU, covering the competition for The Mercury for some years. Away from football Stokes was a more than competent cricketer, playing nine first class matches for Tasmania – the last aged 41 in 1966/67 – and topping the batting averages for the Burnie Cricket Club in 10 of his 15 seasons. A beloved sporting identity on the north-west coast, Ray Stokes passed away in 2017 at the age of 92.